Bleach 351 manga chapter is now available!up next. The next chapter is going to be an exciting chapter. We are expecting to see a battle between Isshin vs “the eerie shadow” that looks like Ichigo’s hollow form or Vasto Lorde form. 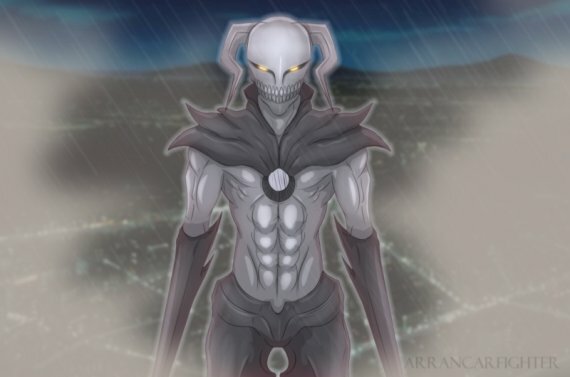 It looks like a powerful and speedy Vasto Lorde, that most probably has the same power like Ichigo. Well I for one would be shock if it suddenly unleashed an attack similar to “Getsuga Tenshou”. Anyway, can Isshin defeat the Vasto Lorde? Find out in Bleach chapter 531. UPDATE 4: Bleach 531 Is now available. See my Bleach 531 review. Aizen is, “literally”, behind all of this. UPDATE 3: See Bleach 531 spoiler below. Aizen is behind it again! UPDATE 2: It’s almost here! The next chapter we expect to see an epic battle between Isshin and the Vasto Lorde. Stay tuned! UPDATE 1: Bleach chapter 351 is expected to be released this Tuesday or Wednesday. Stay tune! Isshin doesn’t understand why the hollow in front of him is black. Isshin battles with the black hollow, Aizen and Gin watches from afar. Masaki senses the disturbance outside and prepares to go out, but she is stopped by Ryuuken. In the end, Masaki rushed out anyway, and Ryuuken follows behind her. Isshin releases his Shikai and rushes towards the black hollow, but he is stabbed from behind by Aizen. End of Bleach 531 chapter. Thanks Jerry for the spoiler. Okay the next chapter, which is Bleach 531 is expected to be an epic chapter. Isshin will be facing the shinigami killer. The killer actually looks like a Vasto Lorde, and surprisingly Ichigo’s form when he is in his hollowfied form or Vizard form. We know for a fact that somehow Isshin will defeat the Vasto Lorde, but as to how he did it, that’s what we are going to find out in the next chapter. We also know that after this battle, Masaki will meet Isshin, she will be the one who will heal him after this battle. But one big question that keeps coming back is how come that Vasto Lorde that Isshin will face looks very similar to Ichigo’s hollowfied form? Did it somehow get pass down to Ichigo? Did Isshin got possessed by the Vasto Lorde and reappeared on Ichigo? This is really exciting, and I can’t wait for the next chapter to be released. But Bleach 531 will be delayed! Fooo…. Bleach 531 release date will be one the last week of this month, March. They are currently on a week break, after Naruto went on a week break last week. So stay tune, I’ll be updating this post once confirmed Bleach 531 spoiler comes out, or when Bleach chapter 531 is released.